In a major exposure, a top data analysis site has revealed that among larger Indian states, "model" Gujarat has the least percentage of vaccinated children -- 50.4%. Basing on 2015-16 Government of India data, the analysis, carried out by Alison Saldanha, says that other richer states like Maharashtra and Tamil Nadu have also begun to show signs of complicity towards the health of their children. 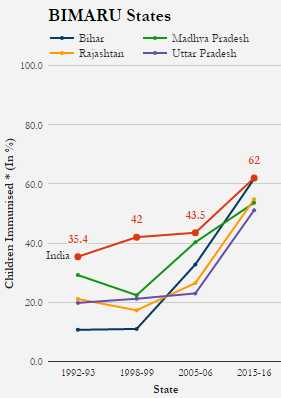 “The immunisation rate of India’s fourth richest state (as of 2013-14 constant prices) is worse than that of some of its most backward states — Bihar, Madhya Pradesh, Rajasthan and Uttar Pradesh (UP), clubbed together as BIMARU (‘sick’ in Hindi)”, Sadanha adds. 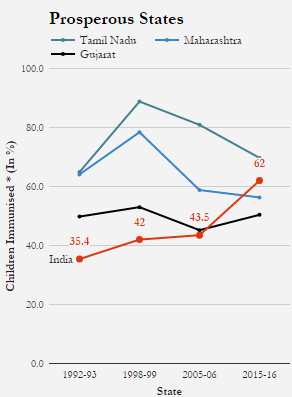 “In Maharashtra, time inconvenience (15.2%) and not knowing where immunisation shots are being administered (9.6%) were cited as major reasons for low vaccination coverage apart from the other primary reasons”, the analysis adds. While Gujarat’s current immunisation rate is up 11.5% from the previous decade, it is now 11.6 percentage points below the national average of 62%, according to the analysis, which is based on National Family Health Survey (NFHS) data from 1991 to 2015-16. Gujarat’s poor showing comes at a time when, across India, “the percentage of children who have received full immunisation that includes polio, BCG, DPT, and measles vaccines, has dramatically risen over 40% in the last 10 years — from the 43.5% reported during the NFHS round three in 2005-06 to 62% in the fourth round (2015-16)”, the site says. “This is mainly due to the significant growth in vaccination coverage in UP, Rajasthan, Bihar and Jharkhand In the 2005-06 survey, these states recorded dismal percentages of children vaccinated — 23%, 26.5%, 32.8% and 34.8% respectively”, the site says. “Short campaigns to roll out one-off vaccinations are one thing, but sustained investment in health is required to achieve long-term improvements in full immunisation,” the analysis adds.